The software is a free portable application. Just unpack it after download and run the executable afterwards. You get two windows on first launch, a select domains window that resembles a text editor and the main program window. 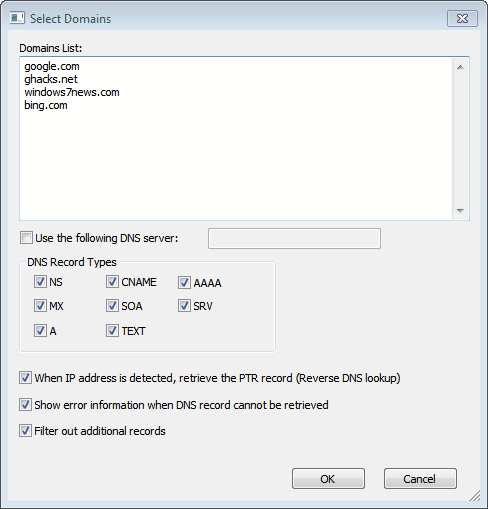 Add domain names to the select domains window and pick the DNS record types that you want to look-up. Four additional options are available. Use the following DNS server - Lets you select a different DNS server, for instance Open DNS, Google DNS or another public DNS server for the DNS look-ups. When IP address is detected, retrieve the PTR record (Reverse DNS lookup) - It is possible to enter IP addresses in the domain list. If this option is enabled, a reverse DNS lookup will be performed to retrieve the IP addresses' host name. Show error information when DNS record cannot be retrieved - Displays errors when a DNS record lookup fails. Filter out additional records - Only display the selected records, do not show additional records. Dns Data View retrieves information about each domain name and IP address. All information are displayed in a table like interface in the main program window. Among the information are the domain name, DNS record type, host name or IP address. The entries can be sorted with a click on one of the table headers, for instance by IP address or host name. A HTML report can be generated for selected items or all items. It is furthermore possible to export the data to a text, XML, HTML or comma delimited file. I see two core applications for DNS Data View. First to verify that DNS records are properly configured for one or multiple domain names, and second to check DNS propagation by using different DNS servers. DNS Data View is a portable software for all recent versions of the Windows operating system from Windows XP to the latest Windows 7 version. It tested fine on a 64-bit Windows 7 Professional system. Interested users can download the program from the Nirsoft website.